The Ephebic Oath was sworn by the young Athenians of Classical Greece. This quote is part of a broader recital, but this section - or rather its underlying principle - always seems to sit at the back of my mind. As a promise to not only protect, but to add to one’s cultural legacy, it is an important premise for us as a practice: To preserve, and to enhance. As architects with a passion for the existing city, we continually reflect on our built environment and its cultural legacy. We are passionately committed to leaving our inherited fabric greater and better than we found it: Sensitive repair, raised fitness for purpose, and new layers that best frame their historic context; whilst speaking of our contemporary culture. The oath seems particularly relevant to the foundation of our studio. I was slightly disheartened to read the above comment piece criticising churches for broadening their appeal to both religious and secular communities, and it compelled me to defend the case for welcoming new uses into these ancient public buildings. Although the thrust of the article was directed against the potentially unhealthy changes to work patterns of millennial office users, it hinted at a disconcerting lack of awareness regarding the scale of the challenge currently faced by the UK’s churches, clergy and parishioners - even in wealthy and densely populated areas. Although many commentators usually concede that new uses in under-utilised church spaces are a positive thing, they are often hugely restrictive as to what they feel appropriate or compatible uses might be. Many people love the romantic notion of solemn and quiet church interiors (in other words empty of people and activity), but rarely witness the daily life of the congregations that worship their regularly, and the necessary vitality that they require to survive. Creating a welcoming environment for as many demographics as possible to use these amazing spaces (and if I were to be blunt – to generate revenue from them) is essential if we want future generations to enjoy them the way that we do – even if that is only culturally, rather than religiously. The suggestion that this sensitively managed evolution might be ‘heresy’ is clearly a provocation, but closer to the truth of some opinions than perhaps the author realises. I might also add to this the social benefits of placing a church’s outreach right in the middle of a mixture of everyday and commercial uses, which helps to reduce the stigma and increase the visibility of facilities such as food banks and homeless support. 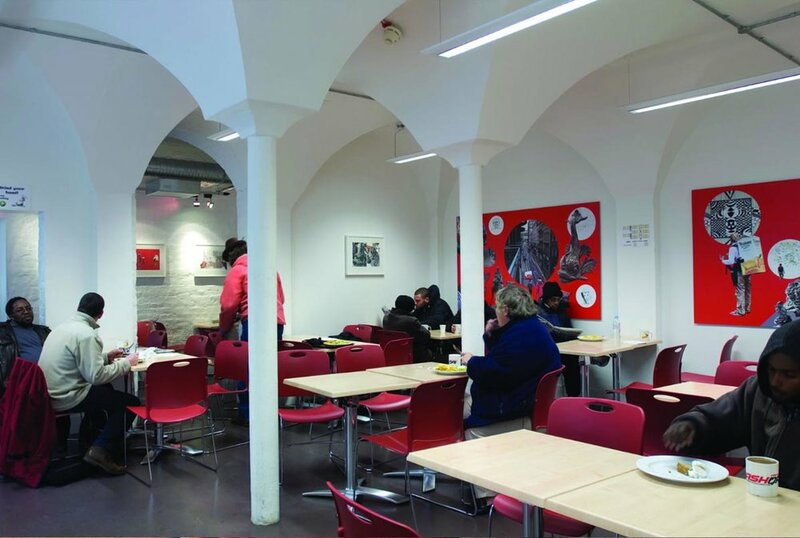 The vibrant cohabitation of the crypt café and night shelters at St.Martin in the Fields is a great example of this. To conclude I think workspaces in churches is a superb idea, and a great example of how low-impact and temporary or reversible infrastructure could help listed church buildings flexibly match their supply to the demands of their social contexts; be they the urbanites of Camden or the rural communities of Herefordshire valleys. Intelligent design grounded in an appreciation of a church’s significance and a sympathy toward its mission will ensure any number of uses can co-exist happily side by side, without sacrificing the tranquil spiritual atmosphere that everybody needs from time to time. If any churches in central Bristol are keen for us to put our money where our mouth is, please give us a call! It would be a privilege to work in such an exceptional environment. It’s a privilege to announce that Fergus Connolly has been appointed Inspecting Architect to Grade 1 listed Christ Church Spitalfields in east London. The church was completed in 1729 to designs by Nicholas Hawksmoor and is widely considered a masterpiece of the English Baroque. Fergus succeeds Michael Morrison, who has held the position for 20 years, and has stewarded Christ Church through several phases of meticulous conservation. Most recent works included his award winning reordering scheme, and oversight of the crypt refurbishment by Dow Jones Architects in 2015. CWa look forward to working with the church and parish over the coming years; with an ambition to maintain its high standard of care, whilst gaining the deepest appreciation of both fabric and mission. Our practice recognises Christ Church as both a hugely significant piece of architecture, and as a incredibly vibrant hub of Christian outreach. It is an inspiration, and our focus, to be working in settings such as this. Connolly Wellingham Architects have received Planning and Listed Building Consent for an extension to a Grade II listed 15th Century manorial barn on the Owlpen Estate in Gloucestershire. The new structure will improve the Estate’s capacity to host a variety of cultural events, reduce reliance on temporary infrastructure, and lessen the pressure on the facilities of the historic barn. The hall occupies a significant location on the site at the conclusion of the lime avenue, greeting arriving visitors with a new Cotswold stone gable. Behind this the hall is excavated into the sloping sides of the valley, greatly reducing the potential visual impact of a new building within the Area of Outstanding Natural Beauty. 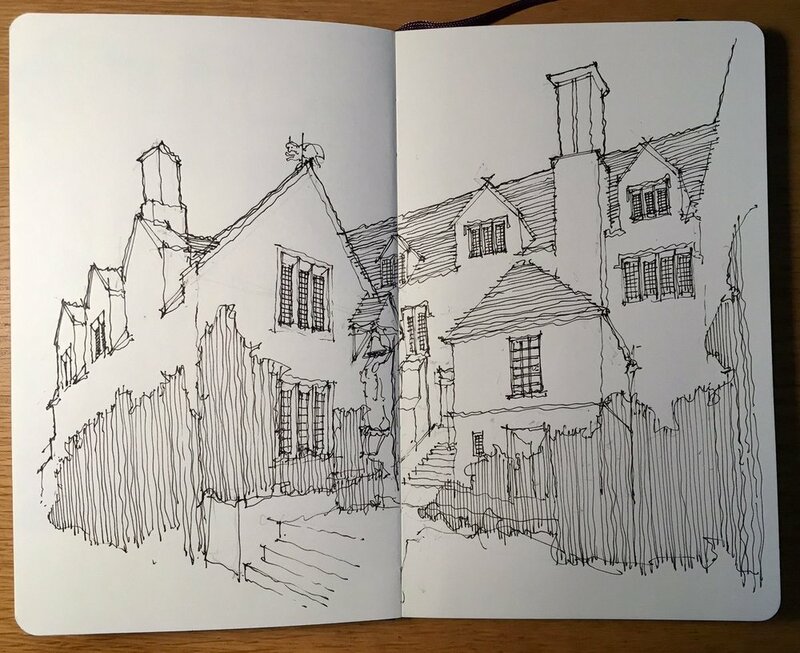 As well as being an intrinsic part of the way we design and communicate, sketching for us is about training ourselves to observe more closely; at a site we are researching, a building we are inspired by, or an urban space we are idling in. 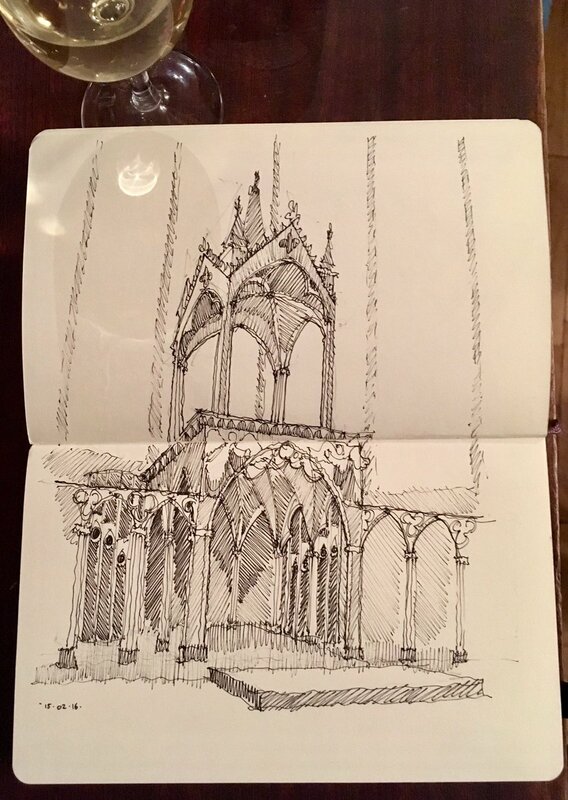 The act of reproducing a sketch necessitates an inquiring eye to establish patterns and hierarchies (and anomalies therein), to identify where design intent is rigorous and where it has been relaxed, to establish the origins and the ways it has been adapted. Although we draw every day in the work that we do, the act of going out into the city and drawing what we see is not always easy to find time to do, and requires a bit of self-discipline. 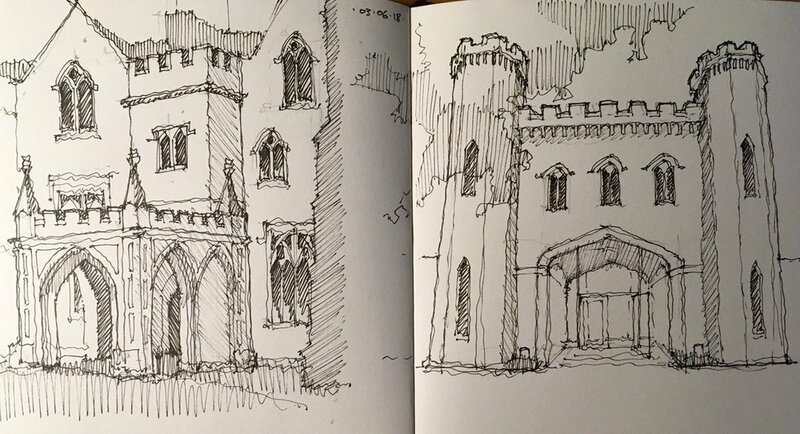 Back in January I set myself the challenge of doing a new (non-work) sketch every week for the whole of 2018, posting my progress on twitter with the tag #SketchAWeek2018. In retrospect given the peaks and troughs of my commitment this might have been better entitled #52SketchesIn2018. We are now entering September, and having totted up my progress to date I have done 26 sketches in the 36 weeks of the year so far. So shame on me, and time now to pull my socks up as we head into Autumn! I share with you here the story so far. It is interesting to see them side by side, and certainly there is a spectrum of quality (! ), but as I tell the students I work with at UWE – sketching is about the process, and not the end product. 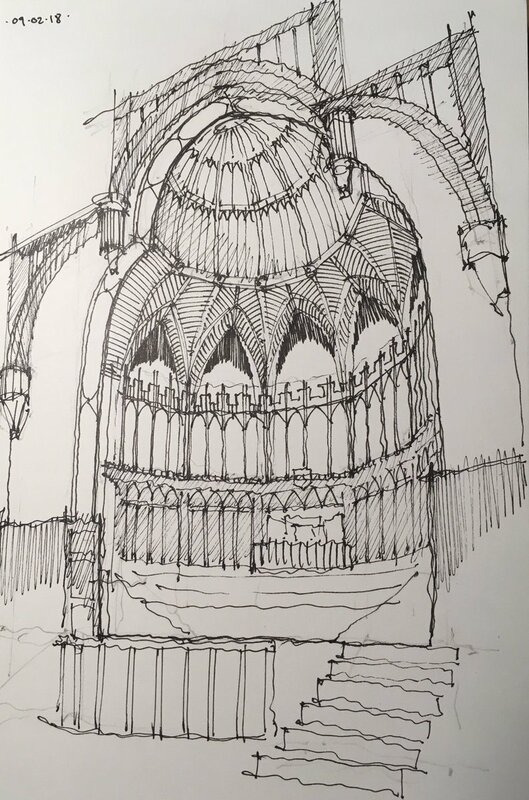 Sometimes a quick and scribbly 30 second snapshot can say a lot more about the atmosphere and vitality of a space than a more considered 30 minute composition. Connolly Wellingham have recently acquired new office space at Spike Island Arts Centre in Bristol, and are in the process of making this creative hub a base of operations for the practice. Anyone who knows Bristol well will likely have visited or at least heard of Spike Island, and we feel incredibly privileged to bring our work to such a culturally engaged and creatively active environment. The arts centre is located on the ‘island’ of the same name; the thin wedge of land between the original course of the River Avon, and the ‘New Cut’ tidal diversion established in 1809 in order to convert the main river into the Floating Harbour. This harbourside area was still a working dock up until its closure in 1973, and the building that houses Spike Island Arts Centre was constructed as a dock-side tea packing warehouse for Brooke Bond Tea Company in 1960. The industrial use continued until 1990 when the factory closed, and the building sat empty until it was acquired by a group of local artists in 1998. The refurbishment of ex-industrial spaces for artist use is a common one, particularly in areas of the inner city that experienced steady decline toward the end of the 20th Century. The refurbishment of the factory was overseen by Caruso St.John architects, a practice we admire - with a strong reputation in the arts sector. The works display many of the intelligently focused and frugal details which characterise so many of their successful collaborations with arts groups. The re-appropriation of the abandoned industrial space for new arts use and creative enterprise is a great example of the reuse work that we are passionate about as a young practice, and we enjoy learning from the building every day that we inhabit it. In addition to the architectural values we draw upon, the programme of SIAC’s exhibitions and events make for a rich, creative environment within which to immerse ourselves and our work. We have been here for a month now and have immediately benefitted from the exhibitions on our doorstep. Upon our arrival at our new home the gallery was exhibiting the recent works of sculptor Zoe Paul, whose work is steeped in the domestic and homely characteristics of architecture and anthropology. We were particularly struck by a series of tapestries woven into the armatures of reclaimed fridge shelves and oven grills. These pieces shared many conceptual similarities with our own work; the salvaging and repurposing of found objects, the elevation of the worn and forgotten into something extraordinary and unforeseen, the use of an existing condition from which to grow a new aesthetic identity, the composition of new elements and their balance against the retention and revelation of the existing, the careful consideration of how these elements physically connect with one another, and the delight to be drawn from curating authentic fabric – what was previously rusted and worthless, now a rich surface of texture and time. We returned from our lunch break truly invigorated. Connolly Wellingham Architects have submitted Planning and Listed Building Consent for a new visitor events space at Owlpen Estate in the Cotswolds, Gloucestershire. The new structure will be sunken into the valley slope adjacent to the Grade 2 listed 15thC Tithe Barn and improve the quality and breadth of revenue generating facilities on the site, to support the long term economic sustainability of the heritage assets. The new building has been composed to limit visibility within the wider landscape and detailed to share a familial resemblance with the existing ensemble of gabled outbuildings within the valley. Determination is expected in September 2018. 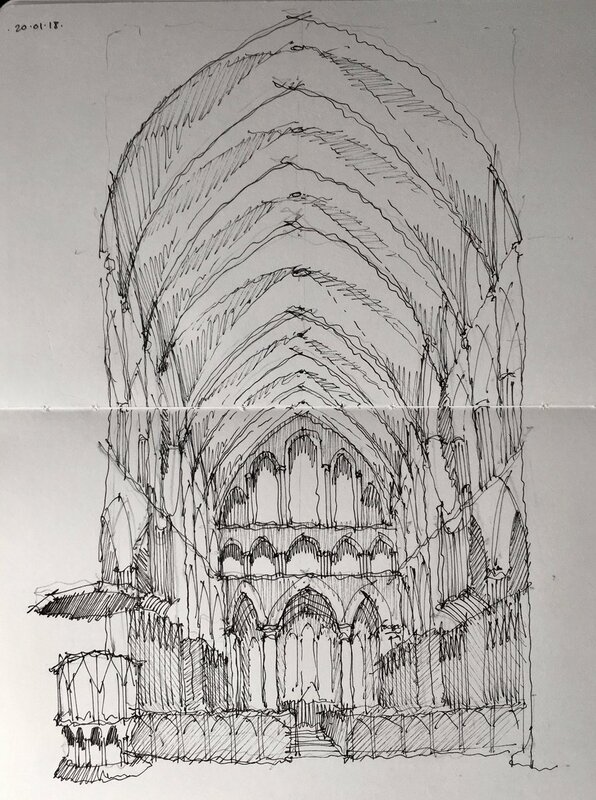 Connolly Wellingham Architects have received Faculty Approval from the Diocese of Winchester for the reordering of the west end at Holy Trinity Church Colden Common. The new additions will provide much needed kitchen and WC facilities, allowing the Church to increase the breadth of uses that the existing nave can support; ensuring this well-loved local building continues to be well-used by its community. Construction is programmed to commence winter 2018. Connolly Wellingham Architects have been appointed to work with OpenHouse Stroud to undertake a Feasibility Study to review their existing building stock within the historic town of Stroud in the Cotswolds. The study will propose refurbishment strategies and identify opportunities for operational improvement across the several city centre sites. OpenHouse Stroud is a charity that supports young people and vulnerable individuals from across Gloucestershire and the surrounding counties by offering short term accommodation and education programmes, creating a community within which they can find their next steps in life. In 1996 the charity moved to their new headquarters in the Grade II listed former Painswick Inn Public House in the centre of Stroud. Built in the 1890s and still retaining its adjacent stable block, the Inn is a relatively complete survival of a 19thC Cotswold public house. Connolly Wellingham Architects have received Planning and Listed Building Consent for the conversion of two agricultural barns to form a residential annexe to the Grade 2 listed Shaw House in Wiltshire. The scheme will see the conservation of the existing early 19thC barns, with areas of contemporary intervention to the elevations to support the new domestic use, improving daylighting within the barn and framing views of the surrounding rural landscape. The Shaw Farm site is steeped in history, lying immediately adjacent to the East Wansdyke, an earth fortification believed to be built by the post-Roman Britons to protect against approaching Saxons in the c.6th Century. The wider site was recorded as housing a Manor house and village in the Domesday Book, both of which were believed to have been abandoned in the 15th Century due to changes in ownership and relocation of agricultural work centres. Conservation and refurbishment works are due to commence Winter 2018.